Pure organic floral water obtained by gentle steam distillation of lavender flowers is all you need to tone, refresh and add moisture to your skin. Nothing is added and nothing is taken away. Totally alcohol free. 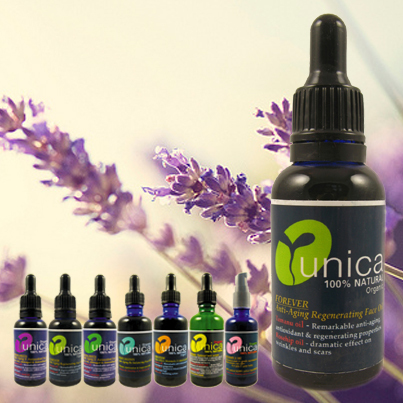 Pura organic Lavender toner leaves your skin feeling beautifully refreshed and rehydrated. Great for use any time throughout the day to uplift both skin and mind. 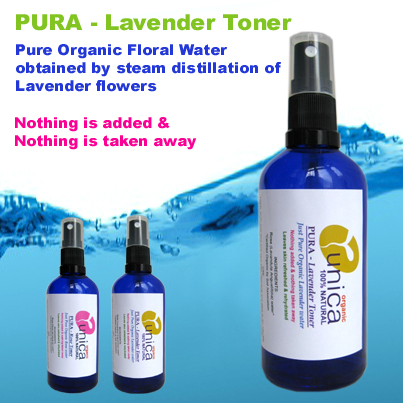 Pura organic Toner can also be used to damp your skin before applying any Unica creams or face oils. This has two advantages: your skin will absorb even more moisture and your moisturizer will last longer as you will need to apply less of it. SKIN TYPES: All skin types. Suitable for very sensitive & eczema-prone skin. USE: Lightly spritz over face and neck after cleansing and allow to dry naturally. Take it on holiday as a natural alternative to soothe heat rash, sunburn and insect bites. Great as a spritz to refresh whilst traveling or when on the go.